A couple years ago, if you wanted the fastest wireless network, the choice was pretty easy. Verizon’s budding LTE network was the speed king, easily outpacing Sprint’s WiMax-based 4G service. At that point, LTE was still just a “coming soon” slide on AT&T’s 4G PowerPoint, and barely a glimmer in T-Mobile’s eye. Fast-forward to 2013, and things have changed considerably. Verizon still has the broadest network, but AT&T is rapidly expanding its footprint nationwide. And a new report from RootMetrics says AT&T’s LTE is also faster, both in upload and download speeds. Sprint has made the switch to LTE. And while it is less widely available and slower than the competition, the network is faster than Sprint had said it would be. Finally, there’s T-Mobile USA, which is also in the early stages of its LTE rollout. While it is last to the game, it has the fastest non-LTE network, meaning that it will have a powerful combination when it finally does get its LTE service up and running. The full report makes for interesting reading, with RootMetrics having studied the major carriers’ performance in 77 U.S. markets. When it comes to pure presence, Verizon was clearly king, with LTE in all 77 markets, compared to 47 for AT&T, five for Sprint, and T-Mobile not yet on the radar. However, both AT&T and Sprint have agressive road maps and are adding markets on what seems like a daily basis. AT&T says it is now in 26 more of the RootMetrics markets, leaving just four of those markets yet to be covered. Overall, it says it is now in 153 U.S. markets, covering 170 million people. 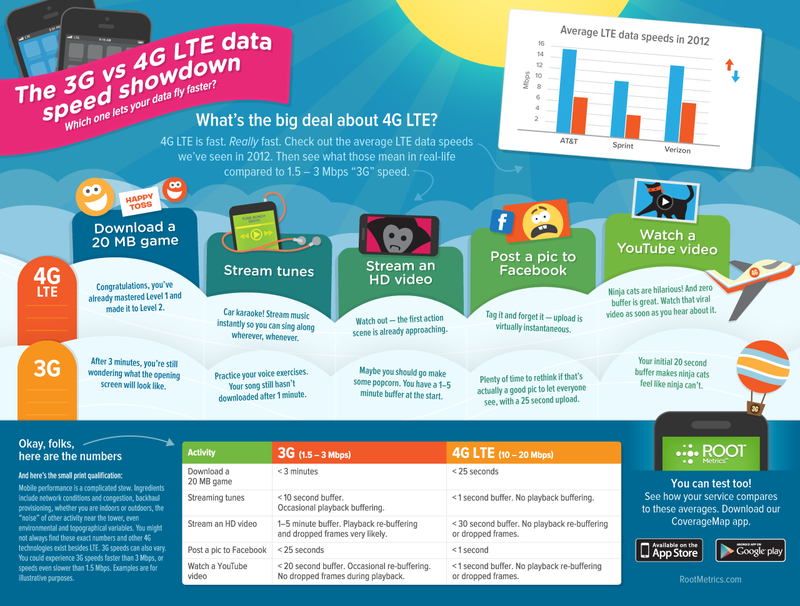 On the speed front, AT&T had the fastest LTE speed and the second-fastest non-LTE speed (behind only T-Mobile). Verizon was the runner-up on LTE, with Sprint significantly slower. However, when LTE isn’t available, Verizon had the slowest speed of the four.